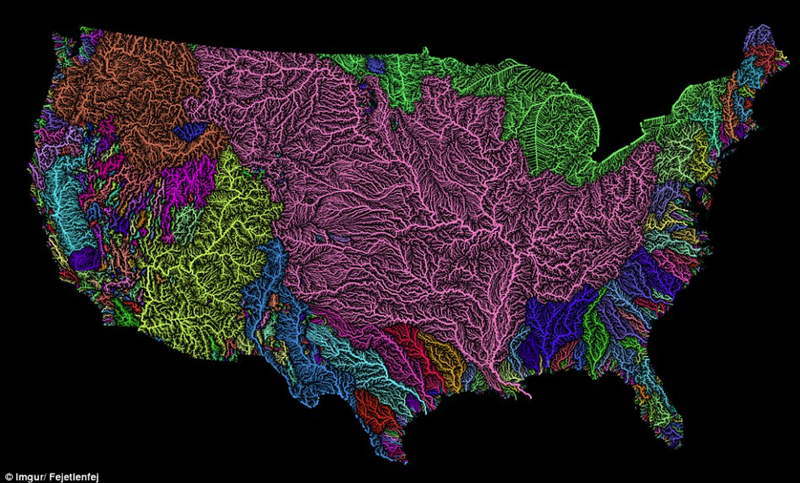 Created by Imgur user Fejetlenfej , a geographer and GIS analyst with a ‘lifelong passion for beautiful maps,’ it highlights the massive expanse of river basins across the country – in particular, those which feed the Mississippi River, in pink. So Muñoz’s team humped their pontoon boat all the way from Woods Hole, Massachusetts to three oxbows whose birthdates they knew—one from about 1500, one from 1722, and one from 1776—and jammed pipe into the lakebed with a concrete mixer. “It vibrates so hard, your hands fall asleep,” Muñoz says. “And then you have 300 or 400 pounds of mud you’re trying to get back up.” But it worked. The cores were a map of time, with today at the top and the oxbow’s birthday at the bottom. In between: A peak of the radioactive isotope cesium-137 marked 1963, when humans started testing nuclear bombs. Using technique called optically stimulated luminescence to date, roughly, when a layer was last exposed to sunlight, they spotted classic floods, like 2011, which caused $3.2 billion in damages, and 1937, which required the largest rescue deployment the US Coast Guard had ever undertaken. AFTER A PARTICULARLY devastating flood in 1927—637,000 people lost their homes, perhaps up to 1,000 killed, $14 billion in period-adjusted damage—human beings deployed the US Army Corps of Engineers to wage all-out war on nature to protect industry, farms, and trade. People tried to warn the government even as construction began on the Mississippi’s infrastructure—channelization, dredging, dams in the upper stretch, and along the middle and lower levees, concrete mats along the banks called revetments, and gates. And [Victor] Baker buys what Muñoz has come up with. “Levees protect against little floods. If you have a super-big flood that exceeds the capacity of the levee, the levees make that worse.” he says. There have been bigger floods than people remember—but the landscape recorded them. And if humans learn to play those recordings back, maybe we can find a new way to get ready for the waters yet to come. Personal-care product company Tom’s of Maine will donate a million dollars to preserve and restore the nation’s water supply by working with the Nature Conservancy on a three out of four possible projects. Why three of four potentials? The company is asking the public to vote for their favorite water protection project. the top three will receive $25,000, $15,000 and $10,000 in funding, in addition to a guaranteed base level of support for each. Remaining funds from Tom’s of Maine will go to support the Conservancy’s North American freshwater program, including on-the-ground projects along rivers and in river basins as well as water use and management projects to ensure that more of our natural waterways are protected. The Colorado River Basin: Restoring and protecting water supplies. The Colorado River Basin covers areas of Arizona, California, Colorado, Nevada, New Mexico, Utah, and Wyoming, and irrigates nearly 4 million acres of cropland in the US and Mexico. It also supplies hydropower plants that generate more than 10 billion kilowatt-hours annually, according to the USGS. Like many areas of the country, the river basin suffers from supply and demand imbalances. 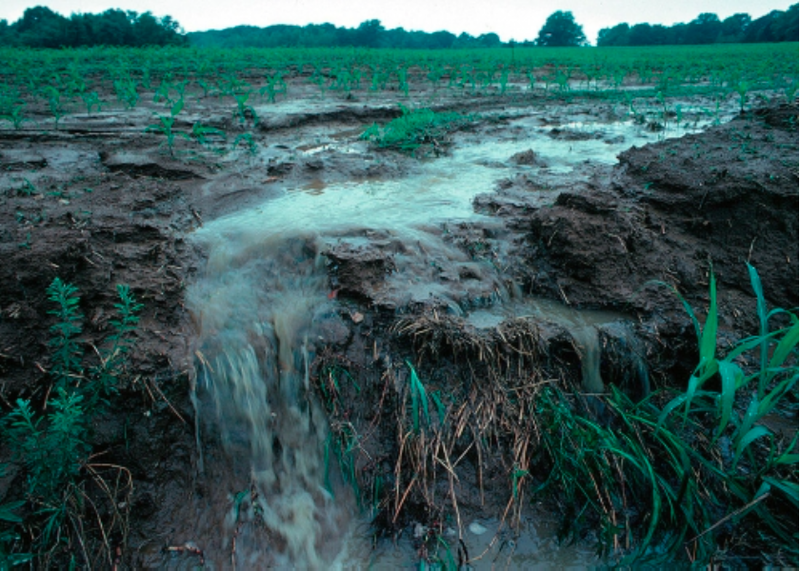 The USGS is conducting a reclamation study that will define the extent of those imbalances and develop and analyze strategies to resolve those imbalances under a range of conditions that could occur during the next 50 years. The Colorado River is about 1,400 miles long and flows through seven U.S. states and into Mexico. The Upper Colorado River Basin supplies approximately 90 percent of the water for the entire basin. It originates as rain and snow in the Rocky and Wasatch mountains. Credit USGS. The Walton Family Foundation (WFF) announced investments totaling $35 million to support the restoration and long-term health of the Colorado River Basin and the Mississippi River Delta. These investments are part of a larger five-year strategy to preserve healthy, flowing rivers and sustain the farmers, fishermen, businesses, families and wildlife that depend on them. Grants included in the investments announced today will support coalitions that include National Wildlife Federation, Lake Pontchartrain Basin Foundation and Coalition to Restore Coastal Louisiana in the Mississippi River delta; American Rivers, Western Resource Advocates, Trout Unlimited, The Nature Conservancy and Theodore Roosevelt Conservation Partnership in the Colorado River basin; and Environmental Defense Fund and National Audubon Society in both regions. WFF has dedicated $20 million over the next two years in an effort to create a more flexible, effective water management system in the Colorado River Basin and improve the overall health of the Colorado River. The lower basin was recently named the most endangered river in the nation by the conservation group American Rivers. The Colorado River is indispensable to the prosperity of the Southwest. It provides water to almost 40 million people in several of the country’s fastest-growing cities. It irrigates more than 5 million acres of farmland, with agriculture and animal production from counties served by Colorado River water resulting in upward of $5 billion in sales. In the face of drastic water shortages, policymakers, water managers and others in the region agree about the urgent need for water management reform. The foundation’s efforts focus on channeling this shared urgency to achieve important agreements that address ongoing water shortages and provide long-term solutions for the benefit of people and the river. Partner with Arizona to manage its scarce water resources through pro-active conservation programs. Advancing the development of an Upper Basin market-based water bank program that benefits rivers. Core to all of this work, the foundation supports on-the-ground restoration of river health in “proof point” tributaries including the San Pedro River, Verde River, the Escalante River, the Gila River and the Colorado River Delta. WFF will dedicate approximately $15 million over two years to support restoration projects that will stem the devastating land loss crippling the coast of Louisiana, where every hour a football field worth of land disappears into the Gulf of Mexico. The loss of wetlands and coastal habitat has left the region vulnerable to storms and rising sea levels. Address future challenges through advances in science, modelling and mapping capabilities. These efforts will ensure meaningful restoration of wetlands, oyster reefs, barrier islands and other coastal habitats that sustain the region’s critical seafood and tourism industries, and protects the city and port of New Orleans from devastating storms. The coast is home to a $34 billion tourism industry and 40 percent of all seafood harvested in the lower 48 states comes from the Gulf. At the Walton Family Foundation, we believe that conservation solutions that make economic sense stand the test of time. We work to achieve lasting change by creating new and unexpected partnerships among conservation, business and community interests to build durable solutions to important problems. Through its environment initiatives, the foundation is investing in two of the most important conservation issues of our time: restoring the health of the oceans through sustainable fisheries and preserving functioning rivers and the quality and availability of fresh water they provide. This work spans four initiatives: Oceans, Colorado River, Mississippi River and Coastal Gulf of Mexico. Learn more at: http://www.waltonfamilyfoundation.org. The $20 million will be allocated toward different groups across the upper and lower river basins, including advocacy organizations such as American Rivers and the National Wildlife Federation. Ted Kowalski, Colorado River initiative lead for the Walton Family Foundation , said helping sustain the river is crucial to supporting both the environment and the economy. While the region would take a huge economic hit, Kowalski said the environmental cost would be worse, and work in the region should be about preventing these problems rather than combating them head on. Morgan Conservation District’s 62nd annual meeting will be held on February 9th. It will be held at the Fort Morgan Home Plate Restaurant, 19873 U.S. Hwy. 34. Breakfast will be at 8 a.m. and the meeting will start at 9 a.m. The cost of the meeting will be $25 in advance, and that will cover the annual meeting, annual membership in Morgan Conservation District, and free breakfast that morning. If you do not RSVP in advance, and show up on the day of the meeting, please be advised that the cost will be the same, however breakfast will not be free, due to our needing to order the food in advance. Our keynote speakers, Bill Hammerich and Andrew Neuhart. Bill Hammerich has served as the CEO of Colorado Livestock Association (CLA) for the past fourteen years. He grew up on a cattle and farming operation in Western Colorado and he attended CSU where he graduated with a degree in Agricultural Economics. Following graduation, he began working with Monfort of Colorado, then Farr Feeders and was with the Sparks Companies before joining CLA in 2002. His time spent in the cattle feeding industry provided him not only with an understanding of how to feed cattle, but also the importance of protecting and sustaining the environment in which one operates. Bill and his wife Sabrina live in Severance, Colorado and have two grown children, Justin and Jessica, and four grandsons. Andrew Neuhart completed both a B.S. in Natural Resource Management and an M.S. in Watershed Science at CSU. After spending two years assisting in precision farming studies in the San Luis Valley for the USDA Soil, Plant and Nutrient Research team, Andrew went to work for the State of Colorado’s Water Quality Control Division. For 9 years with the WQCD, Andrew led a Permitting Unit for discharge permits under the Clean Water Act, for both industrial and domestic wastewater treatment facilities. Working for Brown and Caldwell over the last 4 years, Andrew assists clients with regulatory issues under the Clean Water Act, and has been working with the Ag Task Force, part of the Colorado Monitoring Framework, to get the word out regarding nutrient regulations and their impacts to agricultural operations. Mr. Hammerich and Mr. Neuhart will be speaking about Regulation 85. Regulation 85 establishes requirements for organizations holding a NPDES permit and with the potential to discharge either nitrogen or phosphorus to begin planning for nutrient treatment based on treatment technology and monitoring both effluents and streams for nitrogen and phosphorus. The data from these efforts is designed to better characterize nutrient sources, characterize nutrient conditions and effects around the state and to help inform future regulatory decisions regarding nutrients. Please come to the meeting and learn more from our very knowledgeable keynote speakers! Please RSVP as soon as possible to Angela at morganconservationdistrict@gmail.com or call 970-427-3362. Space is limited. 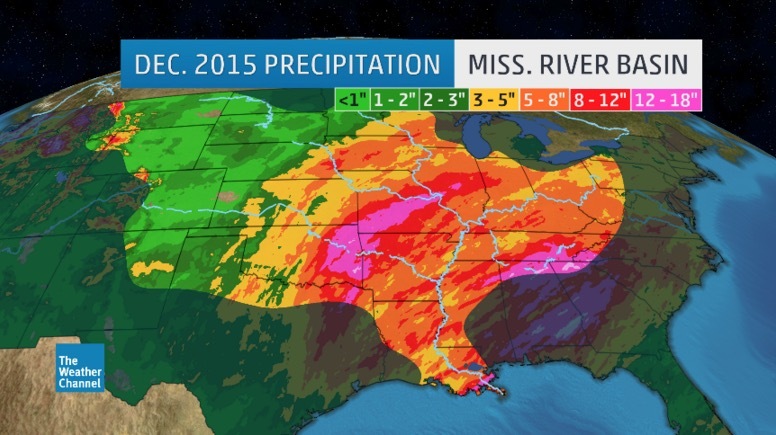 December 2015 precipitation in the Mississippi River Basin via Weather.com. …only a day after the flood on the lower Meramec peaked, water levels on the Mississippi at St. Louis were the third-highest ever recorded. A few days later, record flood stages were recorded downstream at Cape Girardeau, Mo., and Thebes, Ill.
Why was the flooding so bad? Most news reports blamed it on the heavy rain, but Robert Criss, PhD, professor of earth and planetary sciences in Arts & Sciences at Washington University in St. Louis, said there was more to the flood than the rain. In the February issue of the Journal of Earth Science, Criss and visiting scholar Mingming Luo of the China University of Geosciences in Wuhan, China, take a close look at data for the New Year’s flood, treating it as a giant natural experiment that allowed them to test their understanding of changing river dynamics. “Flooding is becoming more chaotic and unpredictable, more frequent and more severe,” Criss said. “Additional changes to this overbuilt river system will only aggravate flooding. The world’s 100 most-populated river basins are indispensable resources for billions of people, companies, farms, and ecosystems. But many of these river basins are also increasingly at risk. As water demand from irrigated agriculture, industrialization, and domestic users explodes, major rivers on several continents are becoming so depleted that they sometimes fail to reach their ocean destinations. 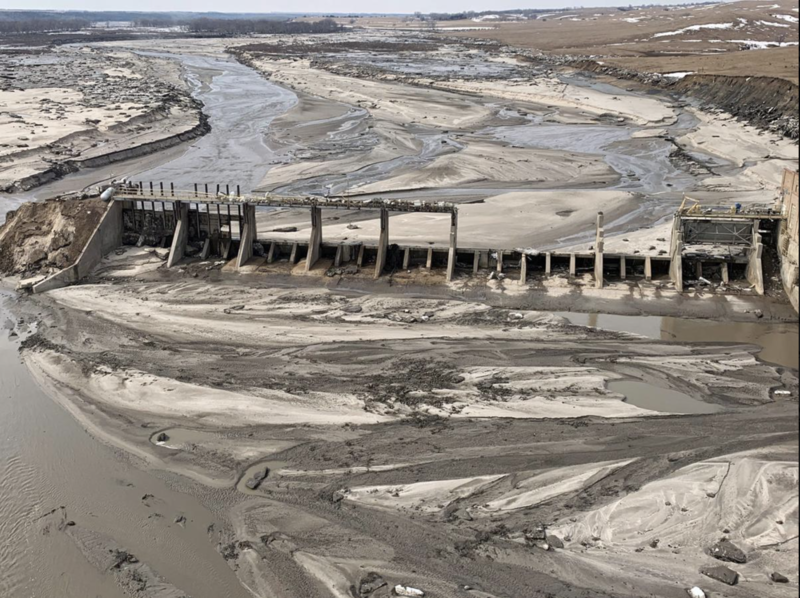 Add climate change, nutrient and chemical pollution, and physical alterations like dams and other infrastructure development to the mix and it’s clear that many communities rely on water resources that face an increasingly risky future. Decision-makers in many of world’s water-stressed basins have attempted to put management plans in place—with mixed results. The United States’ Colorado River is a prime example of a plan that, while well-intentioned, may ultimately be unsustainable. Starting in Colorado and running 1,400 miles to the Gulf of California, the Colorado River is the 14th most stressed among the world’s most populated river basins, and the sixth most stressed if ranked by size. More than 30 million people depend on it for water. 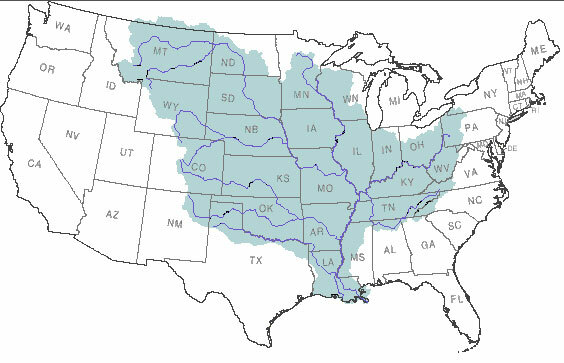 The seven states receiving its water comprised 19 percent of the United States’ total GDP in 2010. Because of its naturally arid setting—and due to its large and growing number of users and resulting high level of baseline water stress—the Colorado has become one of the most physically and legally managed rivers in the world. It is also under serious duress, exacerbated by a decades-long drought. This imbalance between supply and demand means that the river often runs dry before it reaches the Pacific Ocean—posing significant problems for wildlife, ecosystems, and communities that depend on it. Water stress is the ratio of total water withdrawals to available renewable supply in an area. In high-stress areas, 40 percent or more of the available supply is withdrawn every year. In extremely high-stress areas, that number goes up to 80 percent or higher. A higher percentage means more water users are competing for limited supplies. See the high and extremely high-stress areas highlighted in red and dark red on the maps.